In the NMS and the two ACs Bulgaria and Romania, job creation remains low despite high economic growth in most countries. Hence, the employment elasticity of output growth is rather low, but varying by country. In most countries employment and activity rates declined significantly over the transition period up to the early 2000s and started to increase moderately thereafter. In general, the transition period was characterized by a de industrialization and de agrarianization process, while the services sector – market services in particular – became the main employer. Some countries, however, emerged as industrial locations, with manufacturing employment resuming growth recently. The extent of this recovery differed from country to country. Overall, new job creation in services and manufacturing has compensated for job destruction in other activities at least in some of the NMS in the past few years. In most countries the growth of unemployment has come to a halt but structural features have remained unchanged or even deteriorated. Long-term unemployment has become a serious problem in all NMS and the ACs. It has reached much higher levels than in the old EU and continues to rise in the majority of countries. Youth unemployment is particularly high in the Slovak Republic and in Poland. 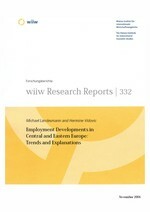 The labour markets in Southeast Europe (SEE) differ substantially from those in the NMS due to the delayed start of the transition, large informal sector activities, traditionally high labour migration (including brain drain) and the already high level of unemployment at the outset of transition. Employment rates are generally on the decline except in Croatia and low compared to European standards. The employment structure shows a picture diverging from that in the NMS and the EU 15, with a continued emphasis on agricultural employment, absorbing workers laid off in other sectors or providing subsistence activity due to the low job creation in the formal sector. A common feature of all countries in the region is the sharp contraction of industrial employment, reflecting the slow recovery of industry after the strong contraction in the 1990s. The services sector is underdeveloped as compared with the NMS and the EU-15. But, taking into account the large informal sector that concentrates traditionally on services sector activities (together with agriculture and construction), the information obtained from official figures seems to underestimate the actual size of that sector. Unemployment in SEE started from a much higher level than in the NMS and is now ranging between 21% in Serbia and 39% in Kosovo – Croatia being the only exception, with comparatively low and declining unemployment, at about 13%. The problem of long-term unemployment is even more severe in SEE than in the other transition countries and the proportion of those who are affected is by far higher.